Rome and faith that helps us to be human. 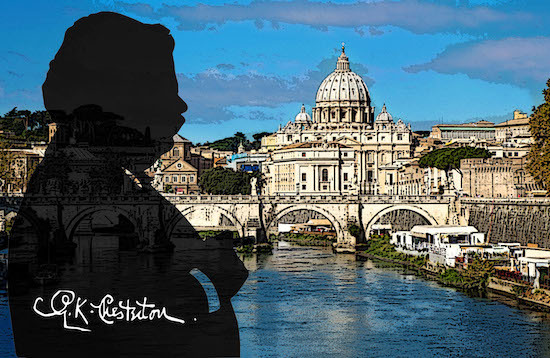 In the city of Rome, the English writer and Roman Catholic convert G.K. Chesterton saw both “mystery" and "ancient meaning”. As a locus of both imaginative fable and concrete historical fact, Rome inspired Chesterton’s profound reflections on human nature and the unique way in which Christian faith corresponds to the needs, hopes, dreams, tragedies and conflicts that have driven the story of mankind. This correspondence can be observed in fields as diverse as theology, philosophy, politics, sociology, literature and art. This conference, “Rome and the Faith that Helps Us Be Human”, will focus on the role that the Eternal City, with its unique symbolic and historical weight, played in Chesterton’s Christian humanism. The workshop includes both theoretical reflection and theatrical performance. In the morning, the lectures and the dialogue with the speakers will help us enter into the theme and the mind of the English writer. The afternoon offers an opportunity to experience Chesterton through a short theatrical presentation and a theater lesson on the work ManAlive conducted by Giampiero Pizzol with some students of the University. This will, in turn, provide an occasion for reflections on the role of theater in teaching and learning. The study day is addressed to scholars, teachers, educators and to all lovers of literature, theater and storytelling.